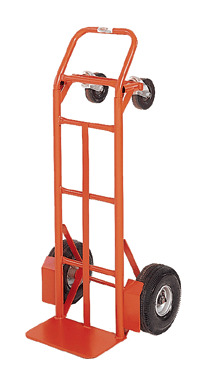 The MECO 2-IN-1 Truck converts from a 2 wheel hand truck to a 4 wheel platform truck in seconds-no tools required. As a platform truck the usable deck space is a generous 14" wide x 36" long. The 7 ga. x 8" x 14" toe plate contains the load in the horizontal or vertical position. 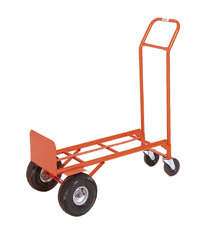 Available with commercial duty 8" semi-pneumatic wheels or industrial duty 10" full pneumatic wheels. Orange enamel finish.